This practice test looks like the real thing. 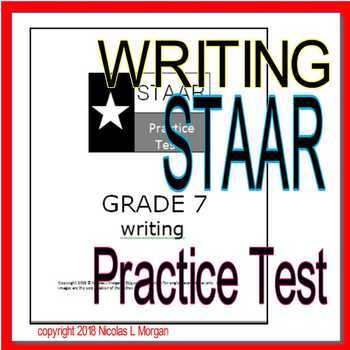 It closely mimics the released 2018 writing STAAR. 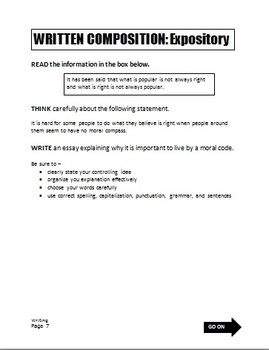 Included: EXPOSITORY PROMPT with planning page, 4 original passages (2 revising, 2 editing), and 30 multiple choice questions (15 revising, 15 editing). 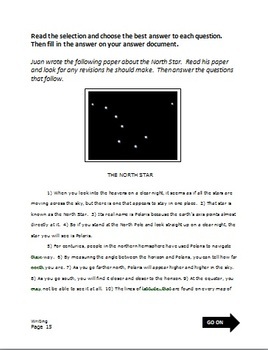 ANSWER KEY includes Student Expectations tested (TEKS). WRITING RATIONALES are also included, making the reteach much easier on you. 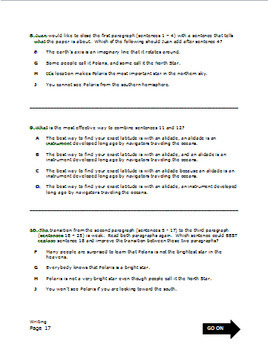 Answer document and lined paper are not included. Copyright 2018©Nicolas L Morgan All texts and images were created by the author and are property of the author. The author of this work is the copyright holder and reserves all rights. This product is to be used by the original purchaser only. This product nor its constituent components may not be resold or used for commercial gain. Copying for a teacher, classroom, department, school or school system is prohibited. Additional licenses may be purchase at a discounted price. This product may not be distributed or displayed digitally for public view. Failure to comply is a copyright infringement and violation of the Digital Millennium Copyright Act (DMCA).